14 Maple Avenue in Morristown, New Jersey. Located in the center of Morristown, 14 Maple Avenue embodies bold thinking and sustainable building strategies that challenge traditional practices. The site — adjacent to the “The Green,” the central park of Morristown — links new development to the existing business district. The project promotes street-level activity and adds to the traditional neighborhood feel by enhancing the mixed-use purpose of the site, providing business opportunities and parking spaces that seamlessly blend into the downtown. 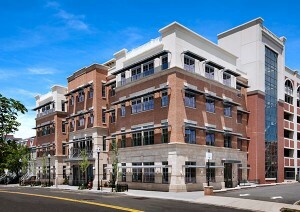 Owned by the Morristown Parking Authority, 14 Maple Avenue provides 34,244 square feet of office space on five levels for several nonprofit organizations including the Geraldine R. Dodge Foundation, the Seeing Eye, the Fannie E. Rippel Foundation and the Morristown Partnership. The building strategies employed in the design and construction of 14 Maple Avenue are bold and dramatic, setting an example for creative design as well as sustainability. For example, the building has a multi-functional landscaped green roof, covered with vegetation and including a special soil medium, waterproofing membrane and drainage system, that provides tenant-community gathering space, reduces solar heat on the roof and retains and utilizes rainwater to reduce the impact of the building on the existing storm water retention system. The building strategies employed in the design and construction are bold and dramatic, setting an example for creative design as well as sustainability. In addition, photovoltaic panels mounted on the roof of the parking garage harness solar energy and supplement the electrical requirements for both the parking garage and the offices, reducing the utility load and costs for the building by approximately 30 percent. Geothermal wells, excavated 500 feet below the parking garage to reach the earth’s constant temperature at 55 degrees Fahrenheit, allow the building to utilize a water-based intake system that converts water to a forced-air heating and cooling system for the offices, which will be 45 percent more efficient than minimum energy code requirements. The project also boasts the largest “Biowall” in the United States — a three-story “living wall” located between the two floors occupied by the Geraldine R. Dodge Foundation and the roof entrance to the building. This vertical garden, in layers of porous material attached to a concrete wall, will be connected to the building’s HVAC system, allowing fans to pull air through the wall into the office spaces throughout the building depending upon the humidity and temperature in the rooms. The plants’ roots act as a natural air filter that removes volatile organic compounds and carbon dioxide from the air as it passes through the wall into the office space, providing clean air and a healthier indoor work environment. The tenants are also dedicated to furthering the green cause by using environmentally friendly building materials in their interior spaces such as low VOC paints, Forest Stewardship Council-certified wood veneers and recycled flaxseed flooring. The project also promotes healthy lifestyles and transportation options; bicycle racks, pedestrian walkways and changing rooms encourage tenants and visitors to bike or walk rather than drive (thereby reducing vehicle-related emissions that contribute to smog and air pollution), and the site features prominent signage linked to nearby rail and bus service. Supporting partners in the project are: Minno & Wasko Architects and Planners; Desman Associates; JSA Architects; Omland Engineering, Wallace, Roberts & Todd; and the William Blanchard Co.